Former X-Factor hopeful turns attention to raising awareness of Nigerian schoolgirl kidnappings. A mother with a young daughter of her own, Annastasia cannot imagine what the families of the lost girls are going through. With an incredible voice that has seen her through to the X Factor judges’ houses on two previous series, vocalist Annastasia Baker is set to release a new single focused on raising awareness for the 200 schoolgirls recently kidnapped in Nigeria. The single, ‘Let Me Go’, sees Annastasia on powerful vocal form as she highlights an issue close to her heart. A mother with a young daughter of her own, Annastasia cannot imagine what the families of the lost girls are going through. And without the financial means to directly impact the ongoing campaign to find them, she has turned to music as a tool to keep the situation in the public eye. The result is this top quality, soulful pop song – due for release June 16th. You can see the video here: https://www.youtube.com/watch?v=RDbKiAsH8tc. It’s not difficult to see from the track why Annastasia Baker’s voice has seen her so close to the X-Factor live finals on two occasions, and this isn’t the only time she has been successful on screen. Crowned winner of Gospel TV Show ‘Time2Shine’ last year, Annastasia is looking to build on that success and use it as a springboard for her own career, as well as continuing the fight to improve the situation in Nigeria. ‘Let Me Go’ is released June 16th – please use #BringBackOurGirls to support the campaign. 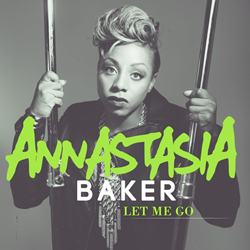 For more information on Annastasia Baker, please contact Vicky(at)quitegreat(dot)co.uk or call Quite Great Music Marketing 01223 844 440.